After a strong performance in this week’s Democratic presidential debate, Hillary Clinton has reclaimed some of the ground she’d lost to Senator Bernie Sanders over the summer, leaving the two in a statistical dead heat in New Hampshire, a Suffolk University/Boston Globe poll found. The survey, conducted Wednesday and Thursday, showed Clinton was supported by 37 percent of poll respondents, and Sanders by 35 percent, essentially a tie. Another 12 percent were undecided, and 11 percent would back Vice President Joe Biden if he decided to enter the race. The poll suggests that Democrats who had soured on Clinton are now giving her a second look in New Hampshire, the site of the first-in-the-nation primary that revived her campaign in 2008 and her husband’s prospects in 1992. “Everybody talks about Bill Clinton being the Comeback Kid, but she’s trying to become the Comeback Kid here and reclaim what she already had,” said David Paleologos, director of the Suffolk University Political Research Center. The dynamics of the race could still change if Biden jumps into the primary. But respondents to the poll advised against it, with 50 percent saying Biden shouldn’t launch a candidacy and only 36 percent in favor. Hillary Clinton reclaimed some of the ground she’d lost to Senator Bernie Sanders over the summer. The poll of 500 likely voters in the Democratic primary had a margin of error of plus or minus 4.4 percentage points. The poll reflected Sanders’ popularity but also voters’ pragmatic view of his prospects: While voters rated Sanders higher than Clinton in both likability and trustworthiness, they thought Clinton won the debate and has the better chance of winning the primary. Fifty-four percent of poll respondents said they thought Clinton won the debate, to 24 percent for Sanders. Another 16 percent were undecided. “I think Hillary was so strong and so firm and so certain and so educated in her answers that I was very impressed with her as a candidate,” said Carolyn Marvin, 73, of Portsmouth, N.H., who nonetheless is backing Sanders. Clinton, the former first lady, US senator, and secretary of state, had long been presumed to be the Democrats’ nominee-in-waiting, and she led Sanders by 10 points in Suffolk’s last survey of the Democratic primary field in New Hampshire in June. But after a fitful summer, Clinton is playing catch-up with Sanders, a self-described democratic socialist whose foray into the Democratic race was initially greeted with bemusement. Sanders’ popularity surged over the summer as Clinton was dogged by revelations about her use of a private e-mail server during her time as secretary of state. Federal investigators said in July that they had discovered classified information on her private e-mail account and that they were investigating whether her e-mail arrangement had put the nation’s secrets at risk. By August, polls began to show Sanders overtaking Clinton in New Hampshire. In September, an NBC News-Marist poll showed Sanders leading Clinton by 9 percent; a WBUR poll put him up by 4 points, and a WMUR/CNN poll conducted by the University of New Hampshire Survey Center put him ahead 46 percent to 30 percent. 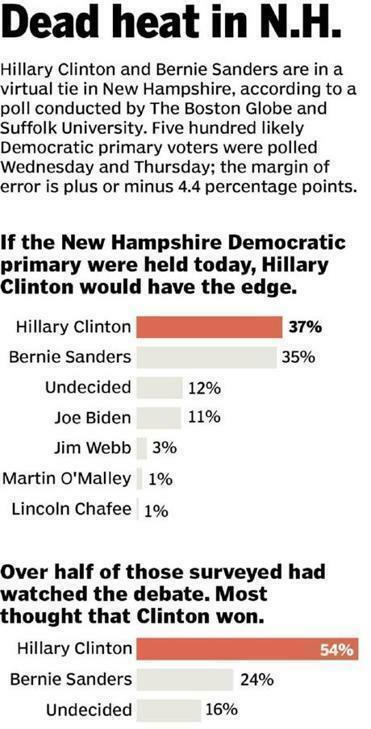 But New Hampshire primary voters surveyed this week said they were not swayed by the e-mail issue. Some voters echoed the frustration Sanders expressed during the debate, where he made the unusual move of rushing to a rival’s defense to squelch a line of questioning. “I’m really just sick of hearing about it,” said Sarah Stowe, 39, a Conway, N.H., mother of six who said Clinton’s e-mails are her own business. However, the poll suggested voters had already made up their minds about the issue: They responded similarly in June and almost exactly the same way whether or not they had watched the debate. Clinton could prove vulnerable on other fronts, the poll suggested. Her favorability rating was 66 percent — the same as President Obama’s — and her unfavorable rating registered at 26 percent in the poll. When voters were asked which of the candidates they found most trustworthy, 33 percent picked Sanders. Clinton placed third with 22 percent, behind Biden, who claimed 23 percent. However, Paleologos noted that voters often make their decisions on other issues, and noted Clinton’s relative strength of the vote and electability. Fifty-two percent of poll respondents said Clinton has the best chance of winning the general election. Just 16 percent said Sanders’ had the best chance. The poll suggested that Clinton distinguished herself favorably from Sanders on guns during her debate performance, Paleologos said. Asked whose position on guns most closely matches their own, 41 percent of respondents lined up with Clinton, compared with Sanders’ 24 percent. Among respondents who hadn’t watched the debate, most were undecided about picking a candidate whose position on guns lined up with their own. But among those who watched, 50 percent sided with Clinton, to Sanders’ 29 percent. Paleologos credited that to Clinton’s forceful analysis of Sanders’ votes against the Brady Bill. The poll also revealed a gender gap, with Sanders leading Clinton among men, 37 percent to 31 percent; Biden picked up 16 percent of support in that matchup. Among women, Clinton claimed a lead of 41 percent to 34 percent for Sanders, with Biden picking up just 7 percent of support. The women’s vote may hold greater weight, however, because women typically turn out for Democratic primaries in greater numbers than men. Among the other Democratic contenders in the race for president, former US senator Jim Webb claimed the support of less than 3 percent of respondents, while former Maryland governor Martin O’Malley got over 1 percent. Former US senator and Rhode Island governor Lincoln Chafee and activist Larry Lessig each picked up less than 1 percent. The poll was conducted on both cellphones and land lines and drew from a randomly selected pool of voters to represent the demographics of New Hampshire’s voting population. The respondents included Democrats, independents, and even some Republicans, who confirmed their intentions to vote in the Democratic presidential primary in New Hampshire.